OPAL (Older People’s Action in the Locality), is part funded by Leeds Adult Social Care and helps support older people within the Cookridge, Adel and Bramhope areas to live safe, healthy and independent lives without isolation. Part of the many things they offer, is helping their members to keep fit and active. From Yoga to tea dances, they’ve plenty of options for anyone wanting to boost their health through physical activity. We talked to Sally-Anne, Volunteer Manager at OPAL, who shared her thoughts on why it’s so important to keep active. Sally-Anne, it’s clear from the OPAL website (click here) that you provide plenty of activities for older people. Why is keeping fit so important? The physical benefits of keeping active are widely known; whether you want to lose a few pounds, keep fit or give your heart a workout so it stays stronger for longer, they’re all important. I personally think though that the greatest benefit is knowing that whatever form of exercise you do, it really does help to keep the mind ‘fit’ too. I’m sure there’s some text book answer on how exercising, even if it’s only gentle or it’s only a little but often, can really lift your mood. We know it does, possibly because here, we have so much fun in our classes, although it’s not easy exercising and laughing at the same time! It’s quite hard to motivate yourself when you’re not used to it, what would you say to someone who’s thinking of doing a little more? I’d say give it a go; what have you got to lose (apart from maybe a little weight – surely that’s a good thing!). Even people who have felt a little daunted at the start, come back time and time again because they know that it can add years to their life and help them maintain their independence. They feel not only the physical benefits (more agile, less tired) but the emotional ones too. Feeling more confident; socialising with other members and, as mentioned, often having a giggle in the process. You don’t need any special equipment either – no need to dash out and buy the latest high tech trainers (when did they become so expensive? ), just wear something that’s comfortable and turn up! We run Yoga and Tai Chi classes which are particularly helpful for older people, as they help to increase flexibility, improve balance and coordination and therefore help to reduce the risk of falls. They’re really gentle and calming too, helping to settle the mind, maybe as the moves are really simple, and it’s not too taxing. For people with mobility problems, we run ‘chair exercise’ classes twice a week. That’s something you can do at home too, even when you’re watching TV or listening to the radio. 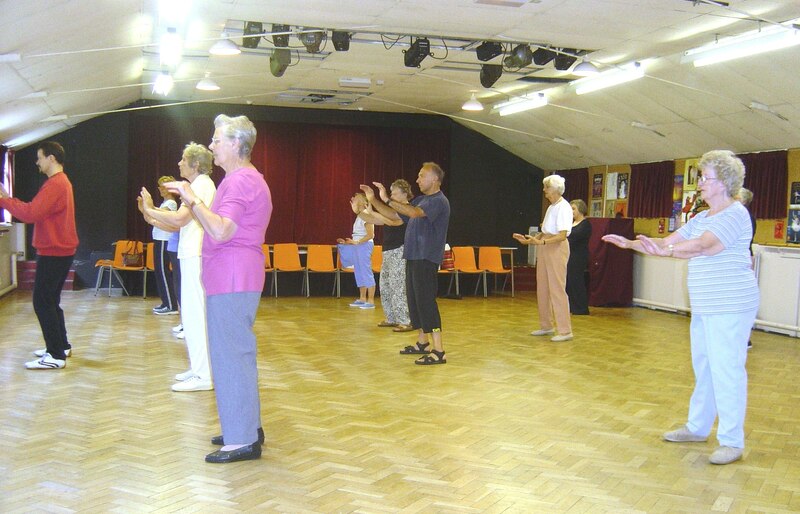 ‘Gentle exercise classes’ are one of our most popular classes along with our Tea Dance, held every Tuesday. We may not all be at the same level as the professionals on Strictly Come Dancing, but we definitely have just as much fun doing it! No need for sequins either, unless you want to of course! If someone was interested in joining in the fun, how would they go about it? The best thing to do is give us a call on 0113 2619103. We can have a chat about membership and share the other services we have too. Anyone in the LS16 area over 60 is welcome, just pick up the phone. Many thanks to Sally-Anne for taking the time to talk to us.